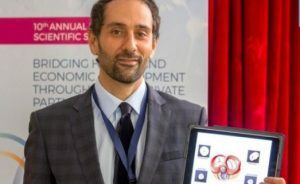 McGowan Institute for Regenerative Medicine affiliated faculty member Antonio D’Amore, PhD, Research Assistant Professor in the Departments of Surgery and Bioengineering, and a member of the lab of McGowan Institute Director William Wagner, PhD, was recognized by his Italian colleagues for his scientific accomplishments. Dr. D’Amore was a finalist for the Franco Strazzabosco Award for Young Engineers – ISSNAF (Italian Scientists and Scholars in North America Foundation), which recognized the top 3 Italian scientists in the U.S. under 40 years old. The recognition ceremony took place in Washington, DC, November 2017. Heart valve scaffold fabrication: Bioinspired control of macro-scale morphology, mechanics and micro-structure. D’Amore A, Luketich SK, Raffa GM, Olia S, Menallo G, Mazzola A, D’Accardi F, Grunberg T, Gu X, Pilato M, Kameneva MV, Badhwar V, Wagner WR. Biomaterials; 2018 Jan;150:25-37. Epub 2017 Oct 6. Link to pdf. Nitro-oleic acid (NO2OA) release enhances regional angiogenesis in a rat abdominal wall defect model. Dr. Antonio D’Amore, Dr. Marco Fazzari, Dr. Hongbin Jiang, Mr. Samuel K. Luketich, Mr. Michael E. Luketich, Mr. Richard F. Hoff, Mr. Daniel L. Jacobs, Dr. Xinzhu Gu, Dr. Stephen F. Badylak, Dr. Bruce A. Freeman, and Dr. William R. Wagner. Tissue Engineering Part A; November 29, 2017, ahead of print. Link to abstract. Link to video: Representative multi-photon image stack showing a three components design approach combining polymeric fibrous matrix (blue); dermal ECM component (red), and; PLGA drug loaded microparticles (green). Courtesy Antonio D’Amore, PhD.